It's officially bikini season ya'll! (enter anxiety and cursing at the Target dressing room mirrors here, those mirrors are evil I say) During the colder months these turkey tacos with their delicious crisply fried shells are what I crave. However, with the warmer weather upon us I needed something fresh and light to take their place. This recipe was spur of the moment and I just kept layering the flavors as I went along. I can’t wait to make it again it’s that good. First, make sure your shrimp is clean and dry. Next, season them with olive oil, cilantro, lime juice, garlic powder (to your preferred taste), salt and pepper. Set aside. Once you have grilled your corn, let it cool down. 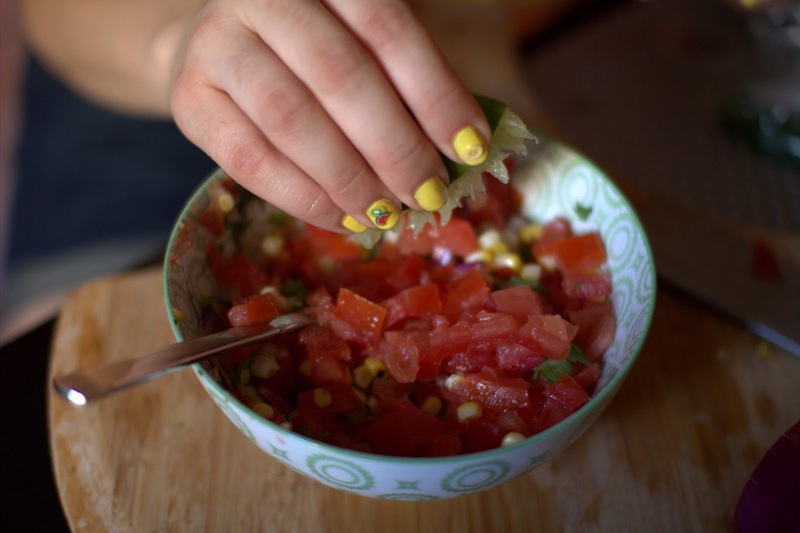 Chop up the tomatoes, Serrano, and onion. 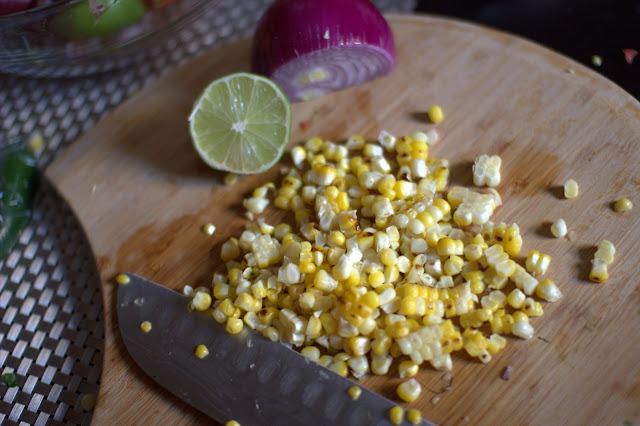 Cut the corn kernels from the cob. Add chopped veggies to a medium sized bowl. Season with lime, salt, and pepper. Mix thoroughly. 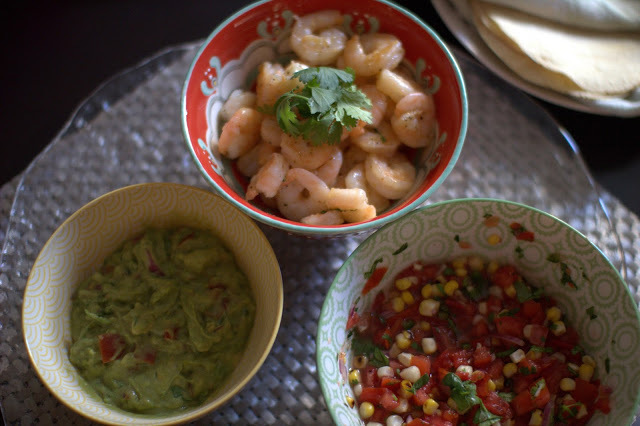 Put your salsa and guacamole in the fridge while you cook your shrimp. 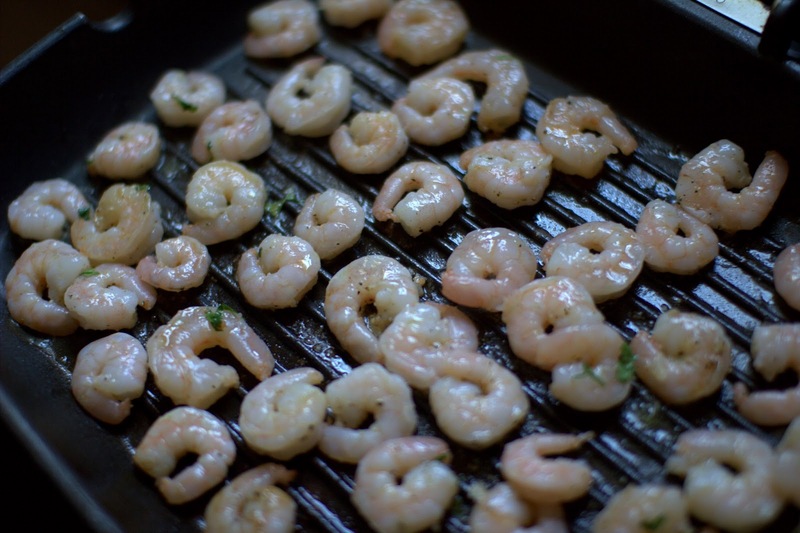 A grill pan is perfect to cook the shrimp. If you don’t have one a good old skillet will do. Heat up your pan on medium high for about a minute or 2. Add shrimp and cook for about 2 minutes per side. Heat up corn tortillas while shrimp cooks. 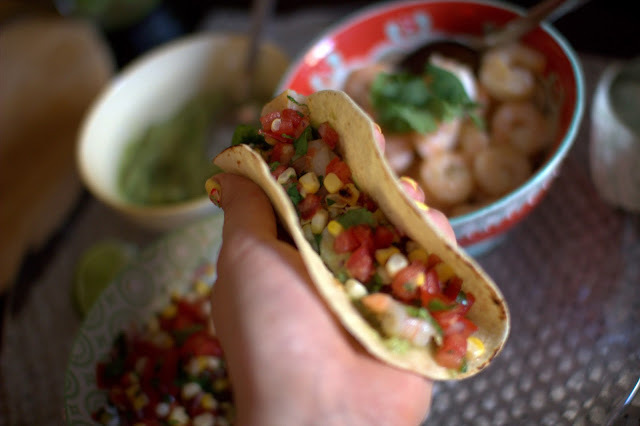 To assemble, smear some guac on tortilla, add some shrimp and top with pico. For a little extra kick I like to add hot sauce. Day-um these look awesome! Perfect, light meal for Summer! i totes hate the mirrors in target too! can't help but love tacos... look so refreshing! OMG These look great and so easy to make... so want some now.